Francie came to us as a wild kitten from the CRD Pound. Now that she is a young adult nearing a year old she is showing a lot of interest in humans. Francie loves other cats and will make a great companion for another cat. It would be wonderful if she could be fostered along with another cat from our Trust-Building section as she already has a relationship with these cats (many not on website yet). Francie is really warming up to people. She has been one of the first of last year’s kittens to approach people. Many of our frequent visitors can now pet Francie a little. She has huge potential. Francie is a slender and beautiful spayed tabby girl with white markings. She did have chronic upper respiratory illness as a kitten and still has a little cough that may remain with her for life. However, she appears to be very healthy! We would love for Francie to get her own foster home, either along with another of our cats or to be a companion to your congenial cat. When Francie progresses in fostering she will be available for adoption. “Foster to adopt” is a great option for Francie. Francie is still very feral. She is an active cat who loves her indoors life. Our senior volunteer spends time with her 3 times a week and Francie enjoys playing but not petting. She and Paddler compete for attention. Francie continues to be active and do well. She still has her permanent upper respiratory problem. She is in the room with Paddler and her other feral friends. Francie loves the visits from Paddler’s sponsor and is allowing petting by her and one other person for the first time since coming a few years ago. Francie is a lovely feral. Francie is in need of a sponsor for her food ($30/month) or for all needs ($50/month) since she is a long-term resident staying in the rescue as a sanctuary home. Lucky is a gorgeous polydactyl kitty and has 7 toes on his big front feet which look like huge mittens. He is friendly once he knows someone and especially if treats are involved. When Lucky first came to us we let him relax on his own in our “book room” and he held court on a big comfy chair. He didn’t trust us at first, but over time he has relaxed a lot. We can now easily pet him. Lucky needs a little more trust-building and then will be available for a foster or adoptive home. He would be best as an only-cat or with one female kitty if there was patience and understanding. A mature single mom or dad or couple would be best for him. Lucky, most often called “Cowboy”, has become slightly more congenial. If he was an only cat with a very patient person (very experienced with cats) who did not expect cuddling and wanted a cat “roommate” he might be able to get a home. He can be petted for a few seconds now and then. He is very comfortable here and has a sponsor who donates for his food needs currently. Cody was a feral about to be put down when we rescued him. 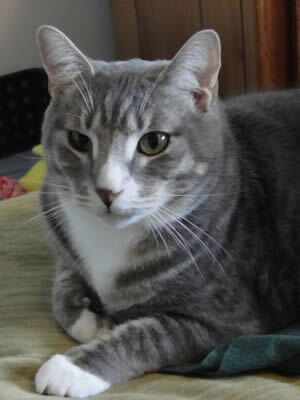 He is a lovely big and gentle tomcat who is enjoying the safety and comfort of the indoors life. He has a girl friend (Siamese cross) named Paddler who is also a feral. They will get near humans but do not yet trust enough for much petting. However, they have a great life here at the rescue. If fostered or adopted together in the future, they could evolve over years and interact more with people. Unfortunately, Cody has a serious skin condition we are now treating. He has patches of open sores that appear on his face, the poor fellow! He has been treated with steroids and antibiotics and we are addressing possible food allergies. He has a frustrating problem and we will update you as time goes by. Cody is doing really well. He is feral but has recently had a volunteer visitor who comes to his room three times a week. He loves playing with her although he still doesn’t like to be touched. He continues to enjoy the ball in the ring and chasing after the laser light and the dangled items from the long wand. Cody is doing well and continuing to have a good relationship with Paddler, his girl friend. He also does well with the other cats in his room. He is still entertaining them with his mastery of the ball in the circle. Cody and Paddler have sponsors supporting them here. Their sponsor comes to spend time in the room three times a week and the cats are enjoying this very much. Cody has been doing exceptionally well with his medical conditions currently seemingly under control. He continues to hold out as a “feral” and loves his relationships with his kitty friends but trots away from humans. Also, Paddler, a feral Siamese X, his old girl friend, is spending more time with him recently. Cody and Paddler could go together to a 100% indoors EXPERIENCED foster home – this means someone with references from a rescue that they have long-time experience with indoors ferals. Also, anyone fostering ferals would also first need to volunteer here for an extended period and get to know the cats. Currently Cody and Paddler are happy with their “colony” here and consider this to be their home. Cody is doing well currently! He is addicted to his plastic circle with the ball going around and literally sits in the middle of it and plays for hours. Cody is never bored as he loves this recreation. He gets along well with other cats. However, he remains feral - allowing humans to be in the same room but not too close to him. Cody's skin condition remains under control but he is now on antibiotics for a problem with his left eye. Poor fellow - if is always something! Cody's skin condition has been under control and he is very comfortable. He enjoys the other cats and spends hours a day playing with the ball in the circle, his favorite toy. Cody is doing well. He has a bit of missing fur on his head still, but no raw looking spots. He is having depo shots less often and that is good! He continues to enjoy life with the other kitties and gets along with all. He is not yet ready to trust humans very much, however. Cody is doing very well!!! He is now on Depo shots and his facial skin condition has cleared up completely. We use this as a last resort, but it does give a lot of kitties more quality of life. He and Cici have been snuggling together a lot lately. We are happy that Cody is feeling so much better!